TUCSON, Ariz.— The Center for Biological Diversity this week began shipping out 100,000 Endangered Species Condoms to a network of 1,200 volunteer distributors in all 50 states. The free condoms will be given away as part of the Center’s 7 Billion and Counting campaign to highlight the world population reaching 7 billion in late October and the effects our overpopulation is having on imperiled plants and animals around the world. The condoms come in six different packages with original artwork and edgy slogans featuring the polar bear, jaguar, snail darter, spotted owl, coquí guajón rock frog and American burying beetle (“Cover your tweedle, save the burying beetle”). All six species are listed as threatened or endangered by the U.S. Fish and Wildlife Service. A volunteer is bringing them to her remote research station in Antarctica to hand out to coworkers. The human population has doubled since 1970, and according to the United Nations it will hit 7 billion on Oct. 31 and at least 9 billion by 2050. Extinction rates for plants and animals around the globe have been accelerating while the growing human footprint consumes land, water and other natural resources. 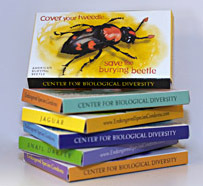 The Center’s condom website, www.EndangeredSpeciesCondoms.com, has images of the six colorful condom packages, information on how overpopulation is affecting climate change, global fisheries collapse, public lands and the species extinction crisis. It allows people to sign up to become Endangered Species Condom distributors where they live. As part of the new campaign, the Center has launched a new website, www.7BillionAndCounting.org, which includes background information, activist toolkits, updates on efforts to highlight the impact of overpopulation on species extinction and links to a new Facebook page. Design donated by Lori Lieber. Artwork donated by the Endangered Species Print Project. © 2010. All rights reserved. Reproduction or redistribution of images must be accompanied by acknowledgement of the designer and artist.